Princess Pageant -- 6 p.m.
Princess Rehearsal -- 6:00 p.m. Junior Queen Rehearsal -- 6:30 p.m.
Queen Rehearsal -- 6:30 p.m. Attendance at rehearsals is mandatory. Young women, aged 15-19 (inclusive) as of March 1, 2019. Essay on separate sheet of paper (200 words or less) on the following: "The Apple Blossom Parade started in 1924. Why do you think the Apple Blossom has been around for so long?" Modeling (business attire) for an in-depth interview with emcee. Winner may go on to participate in the Miss Missouri Pageant. Contestants may be judged in advance on their photos and essays if entries total more than 20. Queen and attendants will ride in Apple Blossom Parade on May 4, 2019. Queen will receive $500 cash. Queen will also receive a 16 x 20 portrait of herself in crown -- compliments of LaTonya Williams Photography, a crown, and flowers. First attendant will receive $300 cash, a crown, and flowers. Second attendant will receive $200 cash, a crown, and flowers. Click here for a Microsoft Word file of the queen entry form. Click here for a pdf file of the queen entry form. Girls, aged 11-14 (inclusive) as of March 1, 2019. Essay on separate sheet of paper (200 words or less) on the following: "The Apple Blossom Parade has been around a long time. What is your favorite memory of the Apple Blossom?" Modeling (party/dressy appropriate attire, NO FORMALS ALLOWED) for a short interview with emcee. Junior Queen and attendants will ride in Apple Blossom Parade on May 4, 2019. Junior Queen will receive $300 cash. Junior Queen will also receive a 16 x 20 portrait herself in crown -- compliments of LaTonya Williams Photography, a crown, and flowers. First and second attendants will each receive an award. 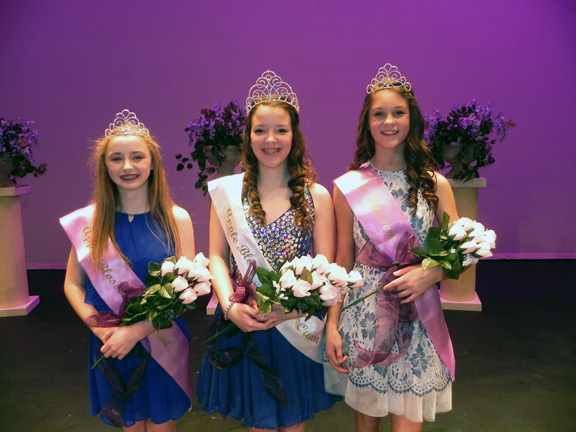 Click here for a Microsoft Word file of the junior queen entry form. Girls, aged 7-10 (inclusive) as of March 1, 2019. Essay on separate sheet of paper (50 words or less) on the following: "Besides the candy, what is your favorite part of the Apple Blossom Parade and why?" Princess and attendants will ride in Apple Blossom Parade on May 4, 2019. Princess will receive $200 cash. NEW: Princess will have professional portraits taken by LaTonya Williams Photography on March 11, 2019, at 4:30 p.m. (Mandatory). Princess will also receive a 16 x 20 portrait of herself in crown -- compliments of LaTonya Williams Photography, a crow, and flowers. First and second runners-up will receive an award. Click here for a Microsoft Word file of the princess entry form. Click here for a pdf file of the princess entry form. Queen Jessica Janorschke, 15, daughter of John and Michele Janorschke, DeKalb High School. 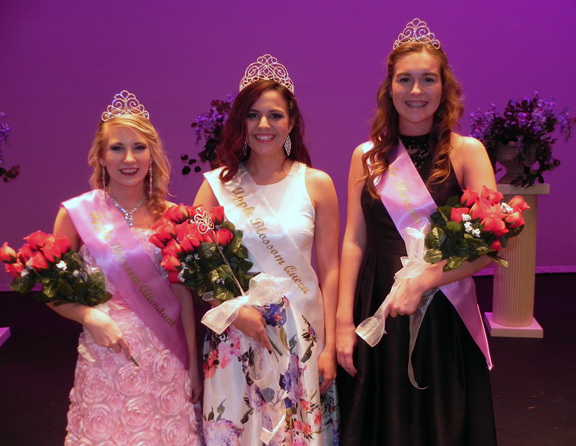 2015 Apple Blossom Queen Jacqueline Janorschke (center) and her attendants. 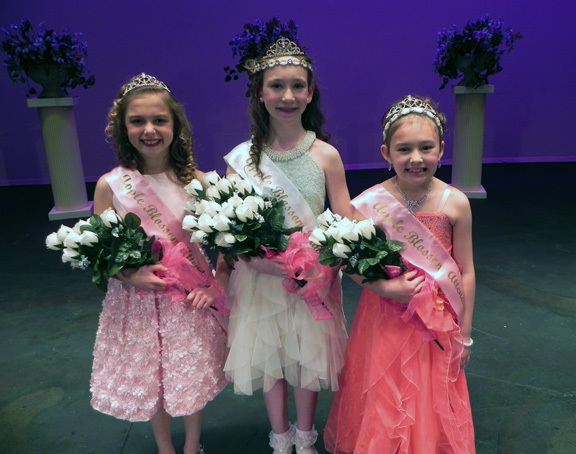 2015 Apple Blossom Junior Queen Emma Schieber (center) and her attendants. 2015 Apple Blossom Princess Lyric Williams-McGuire (center) and her attendants. Queen Jacqueline Janorschke, 17, daughter of John and Michele Janorschke, DeKalb High School. 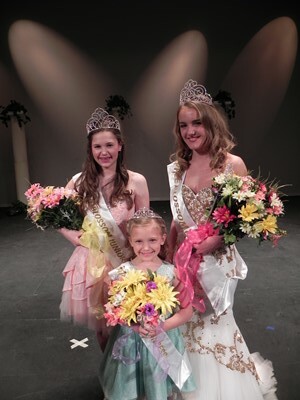 2014 Apple Blossom queen and attendants (left) and junior queen and princess with their attendants (right).